As from Tuesday, 15 May 2018, the fire season for 2018 officially started and will end again on Thursday, 15 November 2018. 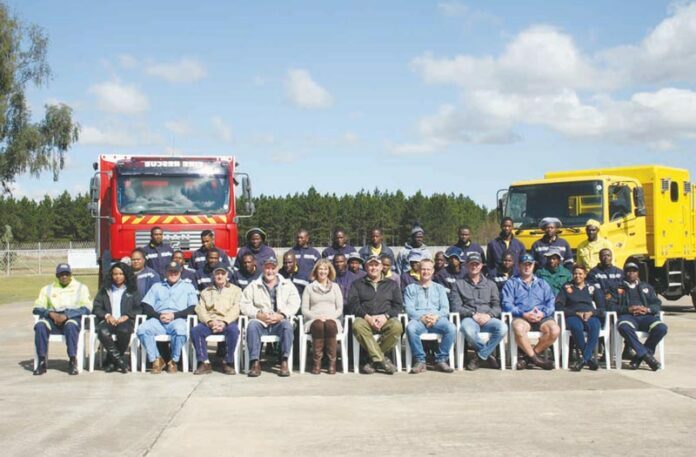 Various stakeholders, in partnership with the MFPA (Mkhondo Fire Protection Association) are ready for this year’s fire season, although they have been busy fighting fires throughout 2017, as well as during the first half of 2018. According to Mr Graham Wright, Fire Protection Officer for the Mkhondo area, scheduled fires (controlled and planned) for 2017/18 were 1 858 while unscheduled fires (in most cases arson), were a staggering 7 509, until May 2018. These unscheduled fires resulted in millions of rands in damage to plantations and other privately owned land, such as grasslands which is often used for grazing of animals. The MFPA now has some great new technology to their advantage – A camera on the spotter aircraft that takes live photographs of a fire and sends the images directly to the IC (Incident Command) Centre to observe and monitor a fire. The following stakeholders will all be involved during 2018’s fire season and are on standby throughout the year: MFPA (4 members) Working on Fire – Ground Forces (25 members) Jenzy Air (3 members) Orsmond Air (1 member) Unique Air (1 member) EVS (Enviro Visions Solutions – various groups) and the Mkhondo Fire Brigade A Fireman’s Prayer: (unknown author) When I am called to duty, God, whenever flames may rage, Give me strength to save some life, whatever be its age. May everyone involved in Mkhondo’s 2018 fire season have a safe and incident-free season and thank you for all your hard work in keeping raging fires at bay.